Web Designers and Developers who go into the World of Freelancing, needs motivation for their future. You need to work from home maintaining all the aspects, making your living from your Designing capability. We have most motivational quotes for Designers from Designers for surviving in life.The list have motivational quotes for designers. Design is the application of intent – the opposite of happenstance, and an antidote to accident. Behavioral design is all about feeling in control. Includes: usability, understanding, but also the feel. It’s art if can’t be explained. It’s fashion if no one asks for an explanation. It’s design if it doesn’t need explanation. I love the comment, “You must love designing for a living.” At that point I usually start to laugh or break into uncontrollable tears. Truly elegant design incorporates top-notch functionality into a simple, uncluttered form. At a meta level, design connects the dots between mere survival and humanism. Many things difficult to design prove easy to perform. — Thomas J. Watson Jr.
Design is not what you see, design is what you make people to see. I hope you will get some motivation from this collection of motivational quotes for designers, and if you are designer and you are freelancing at the same time, then these quotes are must read for you. that list is very informational, the one by Steve Rogers is awesome, Good design is good business. Love that one, it makes so much sense to me. Software development is comprised of cyclical free markets driven by creativity that produces benefits to others and new wealth for those who persevere to be in the right place at the right time with the right idea implemented with many lines of code and a few pretty pictures. Architecture is fascism, nepotism and racism that can produce great buildings and great places implemented with many pretty pictures and a few line drawings credited to someone other than those whose ideas and works produced the results that are actually constructed by others.. I know what I love and I love what I know. I am glad you gathered these nice quote. Sometimes I think even designers don’t remember any more why they design and it became a comodity or a craft to make money out of it. Loved this one: The life of a designer is a life of fight: fight against the ugliness. Glad you liked my Compilation. 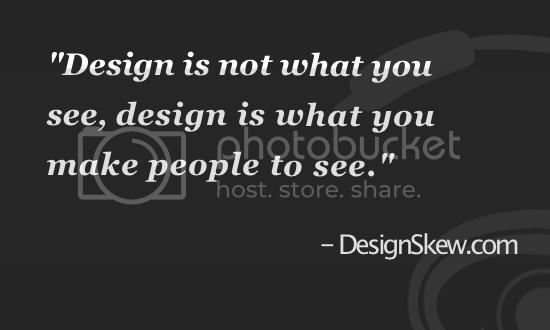 All the collection of motivational quotes for designers are really good. Thanks For this Motivational List. wow nice quotes, i think everyone will like it. thanks bro to share this kind of quotes. I LOVE the witty Douglas Adams quote! These quotes are necessary for the designers, it will be very helpful to motivate them to design creative and think different. Thank you so much for sharing this posting.